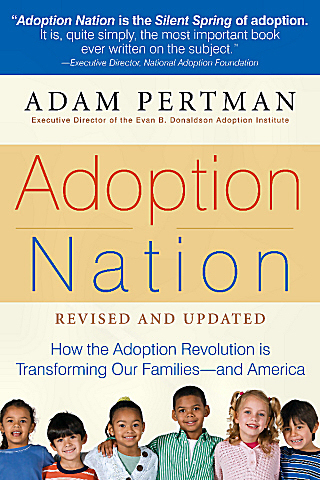 I received an invitation to review Adam Pertman’s updated Adoption Nation last month. They wanted a transracial adoptive single mother’s point of view added to the mix. In exchange for my promise to participate in the blog tour of the book (a new concept for me-where have I been?) on a given date (today) I received my own copy, and two to give away. The amount of work that went into this book, is rather mind blowing to me. I am sure you can scour the net for countless reviews lauding it’s comprehensive scope and broad historical focus. I felt a rather ominous pressure while reading the book as “reviewer” and not just as consumer. (My previous reviews here of books have always been after the fact of books I read and was charmed by. Now I realize that is just a sales pitch, not a review!) I wanted to make sure that I was reading the book through the lens that my audience have come to expect of me (even if I am not sure what exactly that means). I wrote down moments in the book that caused me pause for one reason or another, and asked Mr. Pertman to address them directly. Mama C: As I worked my way through this incredibly rich resource on adoption I did find myself, by way of reviewer asking myself this question; ultimately who is your intended audience here? If you could have this book in the hand of every _______________________ what group would that be? Adma Pertman: Interestingly, I very deliberately wrote this book for a general audience – i.e., people who do NOT think they’re part of the adoption world – rather than for any segment within it. My strong feeling is that we simply cannot level the playing field for those of us touched immediately by adoption unless everyone understands they are critical players in the game, too. Mama C: I was rather awestruck by the amount of historical information you presented in this book, and the amount of historical knowledge I lacked. In my case a historical perspective on adoption from the Orphan trains of the 1850’s to all the variations on birth father registries today was completely absent in my “adoptive parent training”. If you could narrow it down to one or two or the most important historical components of adoption for potential adoptive parents to understand (as it influences the way they will take part in adoption into the future) what would that be? In other words what is the biggest historical take away you’d like your reader to gain from the book. Adam Pertman: I’ll suggest two, though I agree there are many: the movement away from stigma and shame – with all the commensurate changes in understanding/treatment of adopted people, adoptive parents and birth parents; and the related shift from near-complete secrecy to greater and greater openness, again with commensurate changes in a lot of relationships, including the development of what I call “the extended family of adoption” that includes relatives by birth and adoption. Mama C: On page 146 you said that; “The birth parents want to be invited to the party, not to crash it.” This points to what I found to be a consistently articulated message in your book that our biases regarding birth parents (mothers and fathers) needs to be addressed and examined with urgency if the dramatic shift in adoption that you speak of is going to continue in the right direction. If you could imagine one radical, or not so radical step we could all take in chipping away at this party crashing notion, (besides reading your book) what would that be? Adam Pertman: This is tough, because it entails people dealing with insecurities as well as lack of knowledge. So, whether it’s through my book or any other resources, what I’d like to see is the lifting of the shame, stigmas and unnerving (and inaccurate) negative stereotypes relating to birth mothers – and fathers – so that real people can decide to form real relationships based on mutual respect and understanding. I know how sappy that sounds, by the way, but you asked. Actually, a second thing: giving all adult adoptees access to their original birth certificates would send a powerful message – and would do millions of people a lot of good. Mama C: “Today [2007 according to the footnote] 29 percent of adopted children live with single parents as compared to 21 parent of all children….The vast number of those parents are white females who adopted children of color.” (228) A trend you go on to say is “contributing mightily to the national explosion in both single parent house holds and interracial families.” What would you go on to imagine will be one impact this group is going to have on the “revolution” we are part of? How are we helping to further the breaking down of stereotypes? Of replacing the old with the new? Thank you for your responses Mr. Pertman, and the opportunity to be involved in this blog tour. I hope that your own words here will help readers decide if this is an ongoing conversation they would like to invite into their lives via your book. If you’d like to receive your own free copy of Adoption Nation leave an answer to this question in the comments below; One topic I would love a book on adoption to address (differently/still) is: ________________ in the comments below. Sam and I will do an old fashioned random pick of all the names, and contact you directly asking for your mailing address. Great interview! I’m an adult adoptee who grew up in the stigma of shame, so I’m thrilled that the culture of adoption is changing. I have read ADOPTION NATION (it sits in my bookshelf) and have had the pleasure of meeting Adam Pertman — he’s a remarkable man and incredible author. Thank you for adding your personal connection/insight here. Great to hear! I have been doing quite a bit of reading since starting my adoption journey almost a year ago now but am the first to recognize I have so much more to read. I would like to find a book specifically about single parent adoption and all the unique issues that are involved, especially single mamas raising transracially adopted boys. This may be why I love your blog! Maybe this is your book Mama C?? HA! Maybe. Maybe indeed! Thanks for the comment Anne. Great questions (and answers). It sounds like a well-done book and a good read. Here’s my 2 cents… one of my biggest challenges in integrating my (adopted, mixed-race) children into my (white) family is getting past the concept of color-blindness, the attitudes of “it doesn’t matter that they’re not white.” Because of course it matters tremendously. I’m always on the search for a resource that will help me with that one. Me too Marisa, me too. I am sure you are familiar with Love Isn’t Enough (blog) and Adoption Mosaic for starters. (Always putting those two titles out there for starters in case they are not familiar to others too.) Oh, and I am also recently a new fan of My Mind on Paper. (another blog–all on my blog roll). But how much we need that resource–in a book form. Maybe others will chime in here with more suggestions for us. I’d love to have a copy as well! One topic that I’d like to see addressed in an adoption book is foster care adoption. My husband and I adopted our children through the domestic foster care system, and it seems that most adoption books focus on infant or international adoption. Shannon–yes this book would be helpful in that arena too. Perhaps others will chime in here with some more good resources for you too. Looks like an interesting read with a thoughtful interview. One topic I would love a book on adoption to address is how to deal with racism/prejudice/bias/color blindness and transracial families. I continue to feel like I need every.single.resource out there to find strategies, thinking, language to empower my children. YES. YES. YES. I agree. I am seeing a theme here in the comments. A great theme. I’m currently relying on a lot of American literature about foster care adoptions, because Australia has such a poor record on adoptions generally and certainly on adopting from foster care. This book looks amazing and in addition to more Australian books, I’d love a book (or a chapter of a book at least!) to address birth parent relationships in foster care adoptions. In Australia, and I assume in America, the children in foster care adoptions have been forcibly removed from their birth parents and that creates a completely different set of complexities, challenges and opportunities when negotiating a relationship with birth parents than if the child/ren had been relinquished. Thanks for the opportunity, Mama C, and the great review! Yes at least a chapter indeed. I sense hopefully after reading this (his book) , that the kind of work you are calling for is on it’s way. One topic I would love a book on adoption to address is how to support first parents. Do you mean a book written for first parents, or for adoptive parents, or professionals? Or all of the above? As soon as I read your comment I was wondering if there is a collection of essays/memoirs from first parents published recently/at all? That is what I suddenly want to read. Would love to know what you are looking for specifically. I’ve just recently found your blog as my wife and I have started talking about adoption and specifically transracial adoption. We already have a multi-cultural family, my wife is Latina and I am White. Most adoptions would be transracial for at least one of us. I would love a book/chapter/resource that addresses the complexities of adoption in an already multi-cultural family. Thanks for all you do on your blog, it has been really helpful to read! Keep stopping by! SO great to have as many perspectives as possible here! Welcome and thank you. Great to see you here, and to check out your blog too! Welcome. One topic I would like to see more is on transitioning children, especially internationally. Many books address topics on how to adopt and how to raise a child who has been adopted. I would love to see things like: tips on what to bring or do on the first visit, how best to transition a child to a new home, some tips on what to do day one for a child who doesn’t speak English…. Even better if some of this was directed to toddlers who can be more complex then infants but don’t have the communication and understanding of older children. I hope the publishers are reading your comments. And as always I hope others are reading and might offer some great resources for you too. There is a book I would suggest: -Learning the Dance of Attachment by Holly van Gulden and Charlotte Vick. Clinical and helpful text for adoptive Parents on issues of fostering healthy development. I would love to see a book written on blending biological (or, simply older and currently in the home) with older adopted kids. We have a 5 year old son and are adopting (yet unknown) child(ren) who may be older, or younger, but will likely come with some personality and history. How to work that in with our current son is a big question I and others in the same boat have. I’ve yet to see it addressed in any literature (would love reco’s if others have!). I love his line about adoptive parents worrying that birthparents want to crash their party. That really resonated with me. As someone newish to the openness scene, i’ve suffered some major crises of confidence ( yes plural). But I am so happy that my son has his original birth certificate and access to numerous members of his original family. Of course I didn’t answer the question. I guess I’d like to see a book on Openness that really outlines how hard it can be and some of the realities of what its actually like and practical advice on how to handle differences. Every situation is so unique.